Many retirees underestimate how much they’ll need to cover healthcare expenses. In fact, a Center for Retirement Research study recently estimated out-of-pocket costs for a healthy 65-year-old couple to be $260,000 to $570,000 for their entire retirement. Income from investments and Social Security can go toward paying ongoing medical costs, such as Medicare premiums, deductibles and copays, but as healthcare costs continue to rise, this could place a significant strain on your retirement. We can work together to anticipate your healthcare expenses in retirement and account for them within your overall retirement income plan. Another risk-management option is long-term care insurance, which covers a range of nursing, social and rehabilitative services for people who need ongoing assistance due to a chronic illness or disability. While you can’t know for sure if you’ll need long-term care or for how long, a comprehensive policy can help you plan for the unexpected. 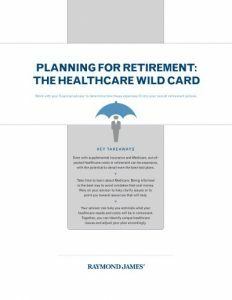 To learn more read our white paper about how healthcare costs could affect your overall retirement income plan.